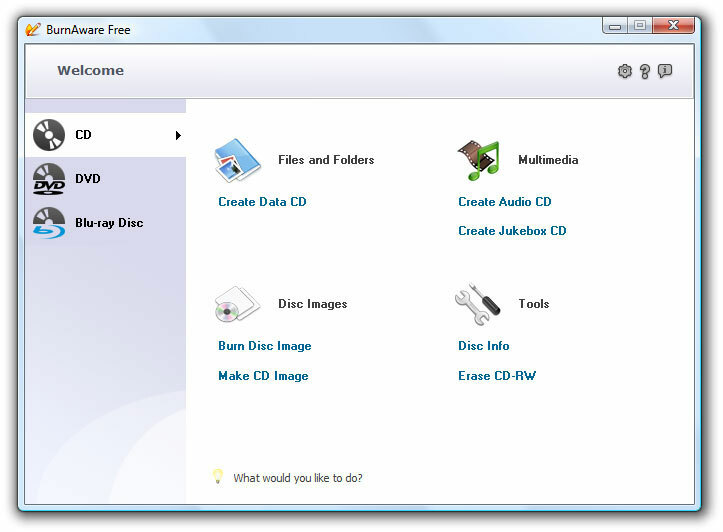 BurnAware Free is a free CD, DVD, Blu-ray Disc burning software. It is ideal for users with basic disc burning needs as backup, creating data, audio, MP3 music, DVD-Video discs and burning disc images. Free, easy to set up, it enables you to save your files to disc quickly and provides clean, flexible interface to help you complete your burning tasks much faster. User will be prompted to restart if 'Allow non-admin users...' option was enabled. BurnAware Free is ideal for users with basic disc burning needs as backup. ...... write Audio CDs and DVD-Video files; create and burn disc images; write multi-session discs and much more. User will be prompted to restart if 'Allow non-admin users...' option was enabled. * Burn, backup or copy your files to CD, DVD or Blu-ray Discs. * Supports recording from command-line and BAT scripts for automating routine actions. * Supports CD-R/RW, DVD-R/RW, DVD+R/RW, BD-R/RE and DVD-RAM media, including high-capacity double-layer media. * Supports UDF (Universal Disc Format), Bridge and ISO9660, including Joliet Unicode extensions. * Create Bootable CD or DVD. Use it as a very big floppy boot disc for recovery purposes. * El Torito creation support with advanced options: emulation type, sectors, platform, load segment and boot message. * Append or update Multisession discs. * Create Audio CDs. Play a CD on your traditional CD player or car stereo. Freezing your files then burning them! Pop-up Free is reliable to kill any popup window and protect your privacy. Qweas is providing links to BurnAware Free 5.2 as a courtesy, and makes no representations regarding BurnAware Free or any other applications or any information related thereto. Any questions, complaints or claims regarding this application BurnAware Free 5.2 must be directed to the appropriate software vendor. You may click the publisher link of BurnAware Free on the top of this page to get more details about the vendor.